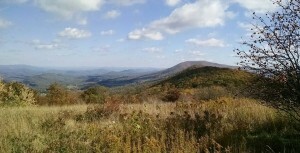 The proposed Mountain Valley Pipeline would be over 300 miles long, including about 5 miles in the Jefferson National Forest (JNF), where it would cross the Appalachian National Scenic Trail (AT) on Peters Mountain (photo at left) and come close to the AT on Sinking Creek Mountain, Craig Creek Valley, and Brush Mountain. In March 2016 the US Forest Service delivered 32 pages of comments on the developer’s lengthy final Resource Reports. A Pittsburgh-based partnership led by the EQT Corporation proposes to cross mountain ridges, steep slopes, streams, rivers and valleys with a huge 42-inch pipeline full of fracked natural gas under high pressure. 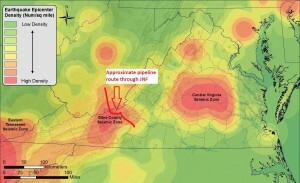 The gas is destined for overseas markets and other places east of Virginia’s Blue Ridge. The Forest Service comments are pretty easy to summarize. If a student received these comments on a class project, the grade would be “Incomplete” or perhaps a generous D minus. A job applicant who received the comments on a work sample would not get an interview. The entire section on Environmental Consequences on Jefferson National Forest Lands is “woefully inadequate” since it does not describe direct, indirect or cumulative effects of the pipeline. Here is a quick look at problems with the pipeline proposal in the JNF. Here is a good test of that assertion: the photo on the left shows the new 12-inch Celanese pipeline crossing Peters Mountain. 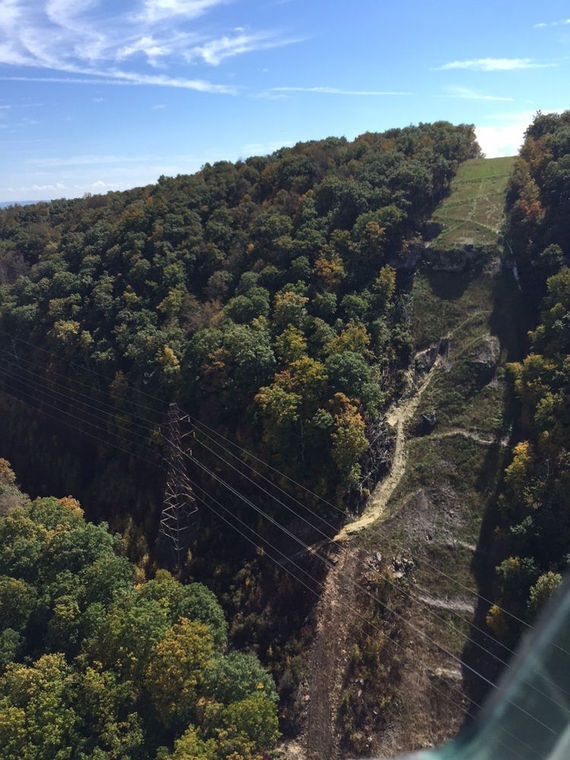 Anyone who drives US 460 west between Pearisburg and Narrows can see that the landscape did not “absorb the visual change” of this small pipeline and its obvious erosion on a steep slope. Imagine a pipeline almost four times as large crossing the AT on the same mountain. As noted by the Forest Service, the developer has never provided a map that shows exactly where they propose to cross the AT. Instead, the developer has delivered vague, imprecise maps and a comment that they might shift the route up to 1,300 feet in any direction, calling this a “minor route modification.” In fact, such a change could move the pipeline into the Peters Mountain Wilderness or onto AT property that is administratively controlled by the National Park Service, which would require approval by an act of the US Congress. The photo is a cynical trick. As proposed, the pipeline would bore underneath the AT only 100 feet from the trail on each side. However, it would still travel up and down the slopes of three mountains in JNF – Peters Mountain, Sinking Creek Mountain and Brush Mountain. Instead of selecting points on the AT and other public trails, roads or highways where the pipeline’s route would be clearly visible (and as required by the Forest Service), the developer shows a tiny slice of the actual crossing spot. To further distort the impact, the photo is taken during the warmer months, so that leaves obscure the view. The standard Forest Service protocol requires views with no leaves. 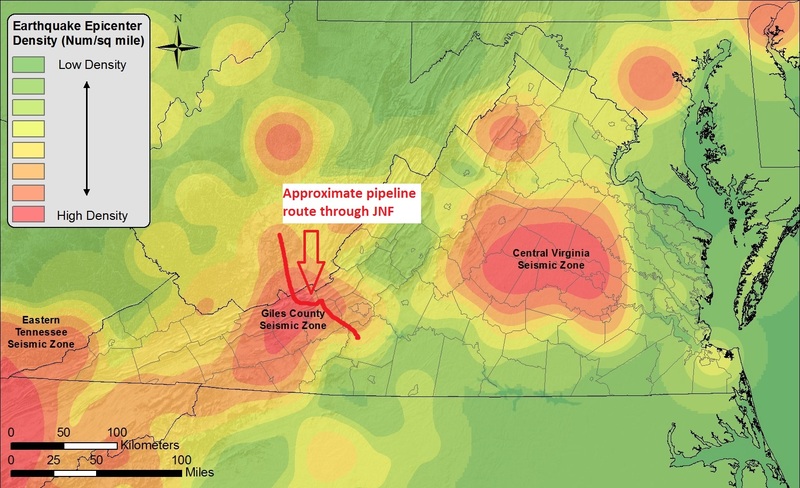 Failure to mention, map or discuss the potential hazards of the Giles Seismic Zone, scene of the largest earthquake in Virginia history, in the exactly the area the pipeline would cross the AT and JNF. Unlike earthquakes in the Western United States, earthquakes in the East occur deeper underground, tend to travel along mountain ranges, are amplified by mountain ridges, and have serious effects much further away from the epicenter. Effects of the 1897 Giles earthquake were most severe along the Appalachian Mountains and were felt as far away as Atlanta, Charlotte, and the Ohio River between Ohio and West Virginia. Failure to note that the proposed route traverses the largest known large rock block landslide in Eastern North America, located on the southeast flank of Sinking Creek Mountain – a landslide that may have been caused by a single earthquake. The US Geological Survey has an entire booklet about this location titled, “The Mountain That Moved” (USGS, 2000). The developer is vague about steep slopes, merely noting that “topography varies from flat to slopes exceeding 45 percent.” The Forest Service labels the report “entirely inadequate” and asks for much greater detail, including site-specific drawings for each cut and fill, the exact slope and how it was calculated and a host of other information. The developer says sedimentation impacts will be temporary; the Forest Service says impacts will be long-term, and it requires site-specific analysis of impact on waterbodies and aquatic life. The developer says in one place that its project does not cross any “riparian corridor” in the JNF, yet another part of the report lists 29 proposed waterway crossings. The developer asserts that all impacts to streams will be temporary, but the Forest Service strongly disagrees, noting that this conclusion is “unsupported by quantitate analysis” or “independent scientific analysis.” The developer is specifically required to discuss all short and long-term potential impacts of blasting such as “fracturing aquifers and damaging perched water tables” as well as impact on living things in the waterways. The developer proposes to cross Craig Creek five times, including two times in 500 feet in the JNF. The Forest Service responds that this plan is “unacceptable given impact to stream, riparian and aquatic resources.” Many of us have suspected that someone is drawing the pipeline route using Google maps from an office in Pittsburgh, and planning of this sort certainly reinforces the notion. The developer ignores the Federally Listed Fish and Mussel Conservation Plan that applies to several of the water crossings, including Craig Creek. The developer ignores the fact that wetlands have the same level of protection in the JNF as perennial streams – a minimum of 100 feet, adjusted for slope. The section on Vegetation, Wildlife and Habitat and Aquatic Resources does not even mention aquatic resources and is very “general and incomplete” about everything else. In the 125-foot right-of-way, all vegetation would be removed during construction, much of it mature oak trees on mountain slopes. The developer says the area will undergo “natural revegetation,” but oak trees do not regenerate quickly or easily from seed and, “Given the age, size and condition of many of the uplands sites, coupled with the level of disturbance expected, natural regeneration to current vegetation types is unlikely.” Impacts to old growth communities are likely to be permanent and should be so described. The developer did an incomplete analysis of impacts on threatened and endangered species, including golden eagles and cerulean warblers. As troubling as these reports by the EQT partnership are, there is something even more troubling. The developer produced the reports knowing that experienced, qualified Forest Service staff would review them, yet they still supplied inadequate and incomplete information. 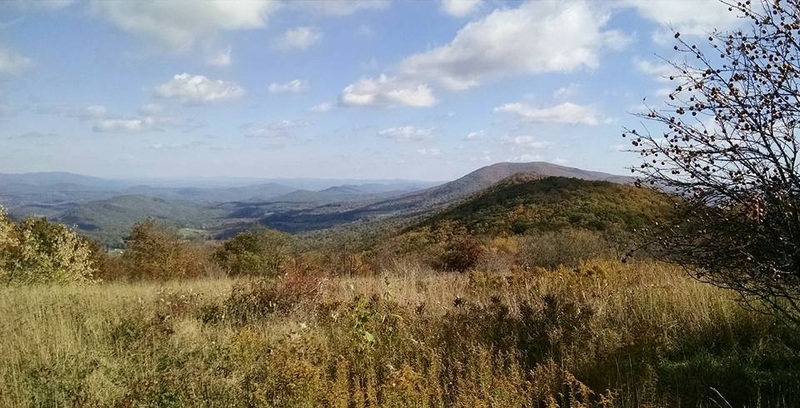 They prepared totally misleading evidence of the pipeline’s visual impact on the Appalachian National Scenic Trail, an iconic part of our regional landscape. If they are willing to be this careless or devious (take your pick) about the five miles or so of their project in the Jefferson National Forest, what are they doing in the other 295 miles where private citizens may have their land taken away by eminent domain if the Federal Energy Regulatory Commission approves this project? ‹ Help RATC during March 16th Roanoke Valley Gives!